Surgery was early in the morning of February 25. The first hour post op was a pleasant one but as the drugs used during the operation wore off, not so much. The first day was spent getting lots of rest. The surgery took about 90 minutes. Dr. Shin opened the fingers and inserted 2 titanium screws into the bone of the pinky finger and 3 titanium screws into the formerly displaced fracture in the ring finger. The ring finger was the most severely broken. Hand is throbbing worse today. Ray says that is to be expected since the nerves are beginning to mend and send electrical impulses. More aware that the other fingers on the hand are badly sprained. 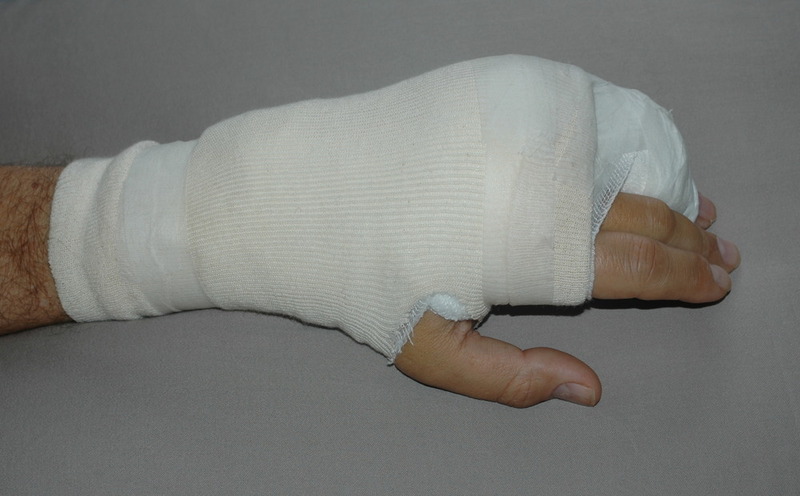 This third cast finally reveals the other fingers so we can see that are swollen, with limited mobility. Other body parts are feeling a little better than before. Please see the first post for the full story of the accident and links to the medical treatment.